and 12 month replacement warranty, this is a must have for any home or business repair shop. GENERAL USAGE: This 1/2 in. 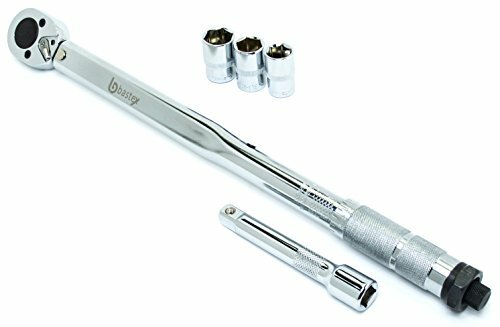 High Quality Professional Torque Wrench Set is uniquely designed for working on car's, trucks, SUV's, Lawnmowers, ATV's and even small Tractors. Anything requiring up to 150 ft.-lb torque this efficient tool is designed to handle with ease. Many small and large engine and maintenance repairs require a specific amount of torque from the manufacture when replacing parts. Often found in garages and shops where automotive repairs require precision torque values. CONTENTS: 1/2 in. High Quality Professional Torque Wrench Ratchet with Click feature and adjustable precision dial indicator. 1/2" Extension Bar for accessing hard to reach places in automotive and home repair projects. 1/2" Drive 3 pc Socket Set includes 21 mm great for large repair jobs.19 mm for most harmonic balancers. 17 mm socket for 1/2 inch lug nuts. Sockets can be used on any 1/2 drive tool, from torque wrench, ratchet or even an impact drill. Hard Plastic Seal-able Carrying Case. DURABILITY: This set is comprised of Heat Treated Steel with Chrome Vanadium Coating providing for strength, long lasting durability, and ease of cleaning. Protection for most common corrosive elements such as weathering and chemicals. Quality crafted for professional use in a variety of repair jobs. HARD PLASTIC CARRYING CASE: Not only is this a complete set with all your basic needs it comes in a weather proofing, easy storage, hard shell plastic carrying case. This not only organizes and protects your kit, it provides ease of storage and portability to almost any job site while holding your items securely in place. WARRANTY: We believe in our products and offer a 30 Day Money Back 12 Month Replacement Warranty on all Bastex Tools.